"Central People's Government" redirects here. 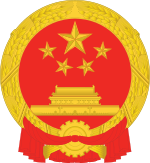 For the central government of the PRC during 1949-1954, see Central People's Government of the People's Republic of China (1949–54). "Chinese People('s) Republic State Affair(s) Court"
"The Court of State Affairs"
The State Council, constitutionally synonymous with the Central People's Government since 1954 (particularly in relation to local governments), is the chief administrative authority of the People's Republic of China. It is chaired by the premier and includes the heads of each of the cabinet-level executive departments. Currently, the council has 35 members: the premier, one executive vice premier, three other vice premiers, five state councilors (of whom two are also ministers), and 25 additional ministers and chairs of major agencies. In the politics of the People's Republic of China, the Central People's Government forms one of three interlocking branches of power, the others being the Communist Party of China and the People's Liberation Army. The State Council directly oversees the various subordinate People's Governments in the provinces, and in practice maintains membership with the top levels of the Communist Party of China. The State Council meets every six months. Between meetings it is guided by a Standing Committee that meets weekly. The standing committee includes the premier, one executive vice premier, three vice premiers, and five other state councilors (normally one of whom serves as Secretary-General of the State Council, and two of whom concurrently serve as ministers). The vice-premiers and state councilors are nominated by the premier, and appointed by the president with National People's Congress' (NPC) approval. Incumbents may serve two successive five-year terms. Each vice premier oversees certain areas of administration. Each State Councilor performs duties as designated by the Premier. The secretary-general heads the General Office which handles the day-to-day work of the State Council. The secretary-general has relatively little power and should not be confused with the General Secretary of the Communist Party of China. Each ministry supervises one sector. Commissions outrank ministries and set policies for and coordinate the related activities of different administrative organs. Offices deal with matters of ongoing concern. Bureaus and administrations rank below ministries. In addition to the 25 ministries, there are 38 centrally administered government organizations that report directly to the state council. The heads of these organizations attend full meetings of the state committee on an irregular basis. The State Council is formally responsible to the NPC and its Standing Committee in conducting a wide range of government functions both at the national and at the local levels, and nominally acts by virtue of the NPC's authority. There has been at least one case where the NPC has outright rejected an initiative of the State Council and a few cases where the State Council has withdrawn or greatly modified a proposal in response to NPC opposition. The State Council and the Communist Party of China are also tightly interlocked. With rare exceptions, State Councilors are high-ranking members of the CPC. Although, as Party members, they are supposed to follow Party instructions, because they tend to be senior members of the Party they also have substantial influence over what those instructions are. This results in a system which is unlike the Soviet practice in which the Party effectively controlled the State. Rather, the Party and State are fused at this level of government. The members of the State Council derive their authority from being members of the state, while as members of the Party they coordinate their activities and determine key decisions such as the naming of personnel. There were attempts to separate the party and state in the late 1980s under Zhao Ziyang and have the Party in charge of formulating policy and the State Council executing policy, but these efforts were largely abandoned in the early 1990s. As the chief administrative organ of government, its main functions are to formulate administrative measures, issue decisions and orders, and monitor their implementation; draft legislative bills for submission to the NPC or its Standing Committee; and prepare the economic plan and the state budget for deliberation and approval by the NPC. The State Council is the functional center of state power and clearinghouse for government initiatives at all levels. With the government's emphasis on economic modernization, the State Council clearly acquired additional importance and influence. The State Council controls the Ministry for National Defense but does not control the People's Liberation Army, which is instead controlled by the Central Military Commission. ^ "The State Council". English.peopledaily.com.cn. Retrieved 2018-01-18. ^ "The State Council". Gov.cn. Retrieved 2018-01-18.